Editor’s Note: This condensed, two-part overview of self-consolidating concrete (SCC) is based on a recent NPCA White Paper. Part 1 explains SCC characteristics, aggregates and equipment, plus a cost/benefit analysis of SCC compared with conventional concrete. Part 2, to be published in the March-April issue of Precast Inc., will guide the precaster in SCC test methods and troubleshooting. Parts 1 and 2 are designed to highlight the critical advice of industry experts to assist precast concrete producers who are using SCC for the first time. If you’ve been following the three-part series in Precast Inc. about diversifying and growing your company, you may be planning to modernize your plant for the greater production efficiencies of self-consolidating concrete (SCC). What makes SCC a “different animal” compared with conventional concrete? Can I produce SCC with my existing mixer and forms? If I do need to purchase more equipment to use SCC, which already costs more than conventional concrete, how can it possibly save me money? What do industry experts say about SCC? What is SCC, and what can it offer me? SCC was first developed by Japanese precasters more than 30 years ago as a means to produce concrete with less labor due to a serious shortage of qualified workers. Therefore, SCC’s primary benefit is the significantly reduced need for labor. Unlike conventional concrete, SCC does not require vibration. SCC flows like lava to fill forms on its own, even for structures with a lot of reinforcing steel and intricate forming. During pouring, SCC’s large aggregates remain uniformly distributed (no settling). The way to find out if SCC is viable in your plant – and the only way – is to give it a try. Run some trial batches of SCC with your crew and products and see what happens. There’s a pretty steep learning curve for SCC, so be prepared to give your staff enough time to experiment and get a good feel for using the material. Do trials with flat slabs and structures with complex reinforcement. While the crew sizes up this new experience, do a cost/benefit analysis of SCC versus conventional concrete. Be forewarned, SCC mixes can be temperamental – even delivery methods (ready-mix truck or bucket) must be addressed in mix design. SCC experts recommend a plant-wide meeting to present your SCC initiative and the particular vagaries of SCC production. Host lunch-and-learn presentations for your crew with your admixture supplier or industry experts on what to expect with SCC. It is important to note: SCC is generally more sensitive to water variations. For this reason alone, automated moisture controls are strongly recommended. Precasters know that the No. 1 and most costly resource in the production of precast concrete is labor. The process efficiency of workers and staff is just as critical for small- to medium-sized producers as it is for the largest precast concrete conglomerates. Perform a time study at your plant to determine the amount of time spent placing, consolidating, floating and patching a conventional-mix product. Record the time (minutes per cubic yard). Then, using a matrix similar to Table 1, calculate your labor cost per cubic yard. The labor rate is an average of the hourly rate (including overtime) plus the cost of health benefits, profit sharing and pension plans. Any step in the production process that does not add value to the product must be identified and eliminated. The second direct manufacturing cost is materials. 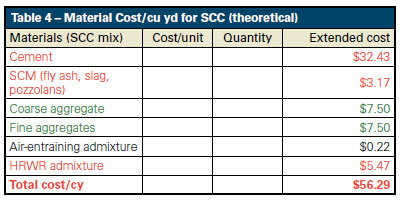 Tables 2 and 4 illustrate a theoretical cost/benefit evaluation of material costs of conventional concrete versus SCC. Increased costs of using each type of concrete are highlighted in red, while cost savings are highlighted in green. The total cost (labor + materials) of producing conventional precast concrete in the theoretical examples shown in Tables 1 and 2 is $63.46 per cubic yard. Once you know the costs associated with the production of conventional concrete, use the same procedure to determine the cost for producing SCC. A trial SCC production run is necessary to obtain actual time-study data. Time estimates from another precast plant will not accurately reflect the efficiencies – or lack thereof – of your crew and equipment. The total cost (labor + materials) of SCC in the theoretical examples shown in Tables 3 and 4 is $58.29/cy, resulting in a theoretical savings ($63.46/cu yd – $58.29/cu yd) of $5.17/cu yd. Remember that the costs and savings realized in this example are based on hypothetical data and actual savings are specific to each plant. A savings of more than $5/cu yd is a substantial sum for a plant producing 50, 75 or 100 cu yds of concrete per day, and savings can be realized even for a smaller operation with an output of 10 cu yd per day or less. Adjustments in workforce staffing hours probably will need to be addressed in order for any savings to be realized. A complete overhaul of post-cast handling may be needed. If patching is no longer a standard practice with SCC, staging areas and secondary handling may be eliminated. These changes can have huge implications on the bottom line, but only if staff adjustments are recognized and acted upon. Sales staff, particularly, must be cognizant of lower SCC production costs for success in bidding and winning new work. As you can see, there are a great many advantages of using SCC, and a lot of precautions that go along with them. Is SCC right for you? There is only one way to find out, and that’s to try it. Arm yourself with information, and expect some failures along the way, but you may find, as other precasters have, that little failures can lead to big successes. Watch for Part 2 of Implementing SCC in the March-April issue of Precast Inc. to learn about SCC testing protocol and troubleshooting. Self-consolidating concrete (SCC) provides the concrete producer with improved product quality at reduced costs. Like most production enhancements, however, improvements do not occur without some investment. Many concrete producers have already discovered that producing SCC is not a walk in the park. Factors related to mix design proportions, aggregate gradations and moisture control require tight product specifications if consistent SCC quality is to be achieved from batch to batch. SCC success depends on controlled aggregate moisture content. New moisture probe technology allows the precaster to control total water in the mix. The first requirement for consistent SCC is a consistent yield of the raw materials. Your goal should be to achieve consistent aggregate material yields by measuring the moisture as the material flows across the probe during weigh up and then correcting the required weight target in real time. This comprehensive process delivers the exact material amount as specified in the mix design. In addition, your process can be set to measure all of the sources of moisture content in the mixer before intake of cement, including a final measurement of blended aggregate, silica, admixtures and color. Total measurement of moisture content of all the “dry” aggregate moisture includes any rinse water left from the last batch or other foreign sources of water. Foreign water sources could be rainwater on a material transfer belt during mixer charging or unmelted ice in the material. Often small amounts of ice will melt during the aggressive dry-mixing time. Armed with accurate data on total water, producers are able – for the first time – to produce consistent SCC spreads. This same technology accommodates high-absorption aggregates. Prior to SCC innovations, the producer’s only option was to constantly sprinkle the aggregate with water, hoping that doing so would produce an aggregate at Saturated Surface Dry (SSD) conditions. However, there was no way to ensure SSD conditions as material moved through the plant, was stored overnight in bins, or exposed to hot or windy conditions. The solution is to introduce a small amount of water during the dry-aggregate mixing cycle to ensure the aggregate reaches at least the SSD state. Another important improvement in the new SCC toolset further reduces errors in moisture measurement. Using sensor physics, the precaster can specify a mix calibration based on dry-aggregate volume (cubic yards) in the mixer. Additional tools for SCC include the ability to graph and store the mix moisture information with the batch weights. The graph produced during batching has proven to be an invaluable tool for QC analysis of the concrete quality. These tools allow producers to monitor moisture, temperature, air content, wattage draw and other relevant sensors, and plot this data in real time with the final batch report for storage. These technological improvements in SCC production control systems give precasters the advantage of being able to request SCC concrete at the touch of a button. Wayne Faulkner is the products plant specialist for Command Alkon and has more than 30 years of experience in engineering and building concrete batch plants. He may be reached at [email protected]. Rob Piosik is the global CP delivery manager for Command Alkon and began his career in concrete plant automation 24 years ago as a support engineer. He may be reached at [email protected].